Happy Easter! Two simple words that bring smiles to faces, Christian or not, for this holiday is a symbol of hope and Spring! This Easter is especially meaningful because of the family I have around me. And I hope you all, wherever in the world you may be, enjoy the love of friends and family, however you define that. Here I am with my beautiful Mum. We had such fun that day, so if you haven't read all about it, click on the link above! I drew out a little bunny. I wasn't so great at it as you can see by all my eraser marks. Oh well, I don't care that I'm not perfect! I think he looks like a cheery bunny! I cut my little bunny out of the paper to make him traceable. The heavier the paper, the longer he'll last when tracing. 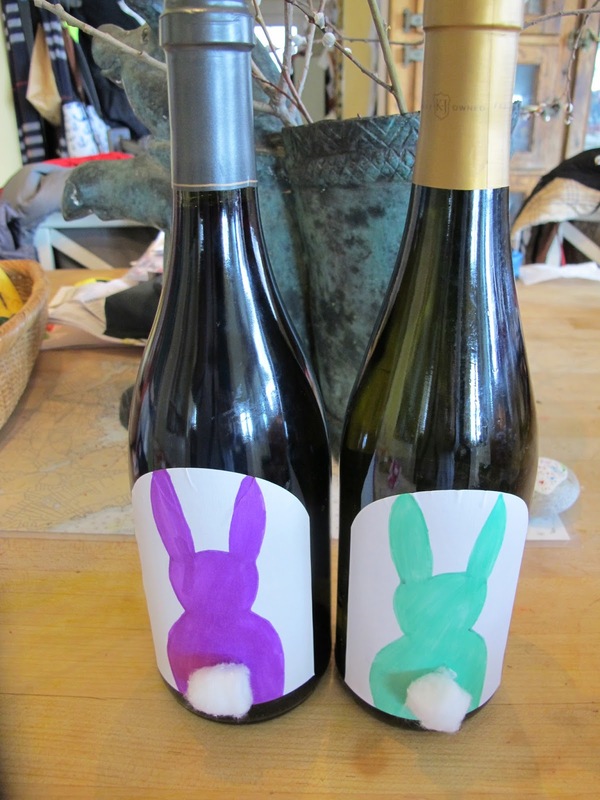 Then, with my sheets of labels, I traced the bunny on each label. Well, 'cause you never know what awkward conversation you're going to get into with Great Aunt Bertha (I don't actually have a Great Aunt Bertha, but I do have plenty of awkward family chats), I used my pencil with a motto that's more than apt for the day, to trace. And I need my darn glasses now since I can't see close up anymore. Uggh, age! Playing around with the different Sharpie colors, I retraced some bunnies, and then colored them in. Couldn't be any easier! 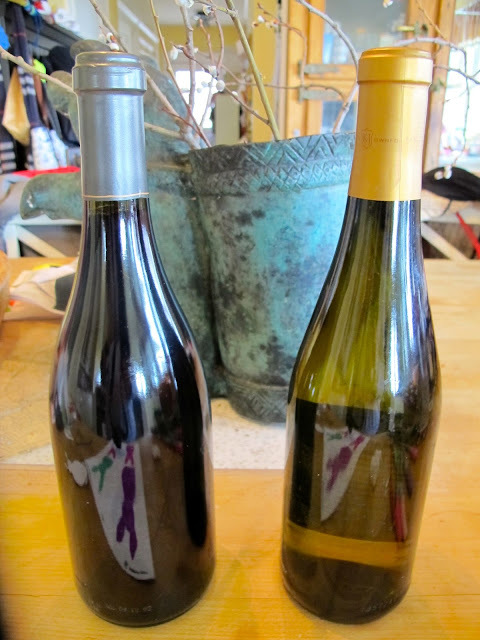 I grabbed a bottle each, of red and white wine and carefully peeled the labels off. Quickly, since I was running out of time as always, I used my glue gun and attached some bunny tails. You can't have a bunny without it's cottontail!! Ready to get packed up for the shindig and egg hunt! And there you have it! We are set to head to the festivities with baskets and jelly beans for the kids, and wine for me, err I mean, the grown-ups in the room.